But let’s face it. The little buggers can be quite the draw on the wallet. What with all the school supplies, clothing them, feeding them, and saving for college; not to mention the cost of replacing all the stuff they break, it doesn’t leave much money for the important things in life. Such as, buying old comic books and collectibles from… oh, I don’t know… Nostalgia Zone, for instance. Well, we might just have the perfect item for returning balance to your bottom line. The official Nostalgia Zone Jarts Missile Game! No need to worry. It’s all fun and games! Mom and Dad, forget about those newer, “safer” lawn darts sets. These are the real deal! Just like the ones from your youth, back when nobody cared about any that safety nonsense. Send those little financial expenses out in the backyard (unsupervised, of course) with their very own Nostalgia Zone Jarts Missile Game and let the fun begin. They’ll love it and, with any luck, you might end up with some of that disposable income all your friends without kids are rolling in. We have a limited supply that is priced to sell! A bargain at $399.99 each! That’s less than four hundred dollars! Order now while supplies last or until the FTC gets wind of this. 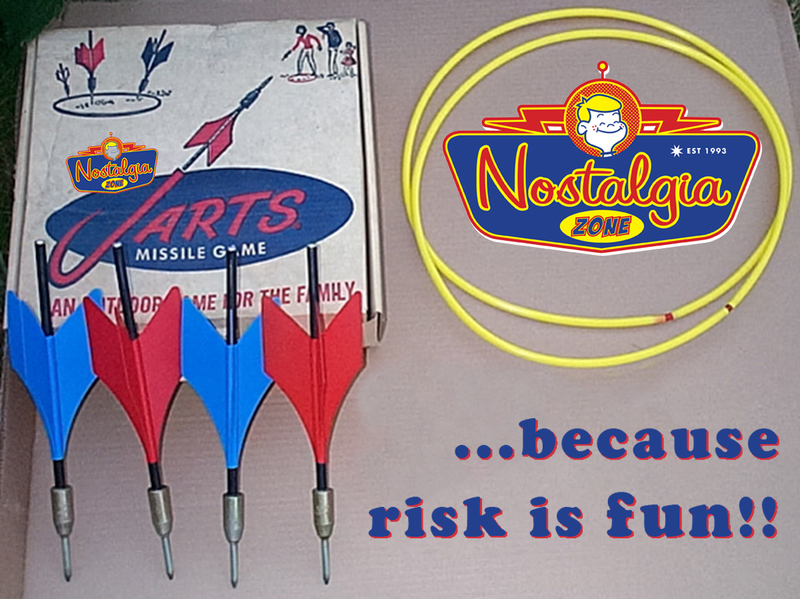 Nostalgia Zone Jarts Missile Game and kids! Nothing could be more fun! The preceding is a parody ad, but you knew that. Right?